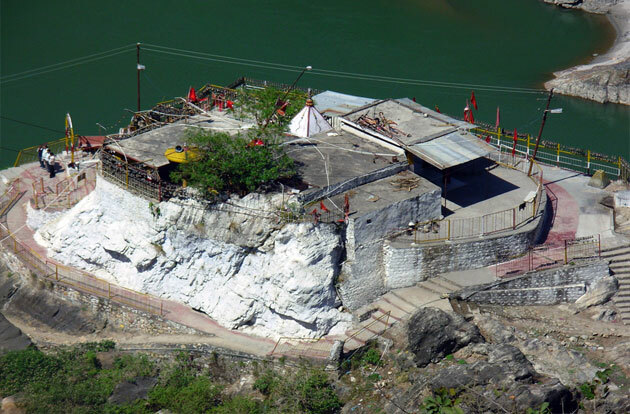 Situated at a height of 20mts above a high rock, Dhari Devi Temple is most visited by Hindu devotees. The temple is based along the banks of river Alakhnanda. To reach the temple one has to travel a distance of 19kms from Srinagar on the Srinagar-Badrinath highway that reaches up to Kaliya Saur with a further down-trek to another half a kilometer to Alkahnanda River. As per old sayings, this temple was once moved by heavy floods that could float the idol. The idol got hindered by a rock. When the local people reached the site they heard the cries of the idol and a divine voice instructed them to install the idol at the spot where it was found. Since that time, the idol is positioned at the same place and is known as Dhari Devi temple. It is under the open sky and thousands of devotees each year on the way to Badrinath pay their obeisance here. The Dhari Devi temple has only the upper part of the Goddess Dhari. The lower part is said to be in Kalimath in Rudraprayag district. It is said that the idol of Dhari devi can never be put under roof and that’s the reason it is always exposed to open sky. Tourists here are not allowed to take photographs of Dhari Devi. The residing place of villagers around this temple was named as Dhari village after the name of this temple. The place has a hanging village that connects to the Dhari devi temple and leads to Dhari village.